CITIZENS' FINANCIAL REPORT 2018 On behalf of the Mayor and City Council, I am proud to present this year’s Citizens’ Financial Report. This report is intended to increase awareness of the financial operations of the city. This report highlights much more than the city’s finances. WE ARE TELLING THE STORY OF OUR CITY AND WHAT MAKES IT A GREAT PLACE TO LIVE, WORK AND PLAY. My thanks go out to the city staff who take great pride in developing a budget that provides funding for quality services, while keeping expenditures within fiscally conservative parameters. This would not be possible without the support of Mayor and City Council, as well as the citizens and the business community of Burleson. I will be retiring in February 2019 so this will be my last Citizens’ Financial Report, I want to express my gratitude for the service staff, elected and appointed officials, provide. I’ve worked with some wonderful people throughout my 30 year career serving in several cities, but as a group, Burleson is the best. Our city and I have been blessed to have such talented and good people with high values who really care about each other and our citizens. at providing only what is necessary, we take it to the next level. We are looking for ways to make our children’s future brighter through education and enrichment. We are helping our residents gain the knowledge and skills they need to ensure success for families and creating a robust workforce for local businesses. The first-of-it’s-kind Burleson Opportunity Fund, the award-winning Burleson Works Program and the innovative Burleson Drowning Prevention are just a few ways Burleson does much more than provide standards services to their residents, we go beyond. mmunity that is constantly looking for ways to do better; ways to enhance safety, convenience and quality of life. 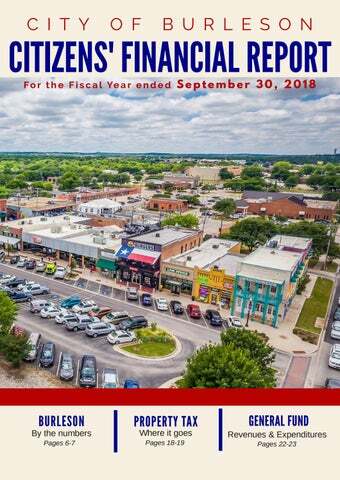 In 2018, the city launched Burleson Works, a program of the Burleson Opportunity Fund and the Burleson Economic Development Corporation. This new program provides an avenue for Burleson companies and citizens to connect with one another in order to fill the skills gap in our community’s labor market. This is done through partnerships with local and regional schools where scholarship recipients obtain skills and certifications to gain employment. By encouraging citizens and students in our region to further their education and gain technical skills that are needed in our labor market, we create a better equipped, trained and certified regional workforce. This enhances the regional economy by supporting local companies and strengthens the partnerships between technical schools, local businesses and the local school district. The program partners with Burleson businesses to determine what positions will be vacant in the upcoming 12-to-24 months. Recipients of the scholarships are then selected based on the specific needs of the businesses. Local companies have an opportunity to interview the applicants before awarding the scholarship. If selected, the applicant will begin training through one of the program’s educational partners. During the program’s first year, it received recognition for Workforce Excellence by the Texas Economic Development (EDC). www.burlesonworks.com Kolton Makarwich, a 2018 Burleson Centennial High School graduate, was a recipient of a Burleson Works Scholarship for training as a Hydraulic Mechanic for Wagner Smith Equipment Company. He is currently in his second semester. DROWNING PREVEN Over 1,000 children received free drowning prevention lessons in our community this year. Firefighters taught free CPR to parents and certified every City of Burleson employee in CPR. Putting over 400 trained individuals into our community. LET'S TALK How does the city fund all of the services residents receive? The city uses a variety of funding to provide services. Such as property taxes, sales tax, charges for services, licenses and permits, fines and forfeitures, franchise fees and bonds. Read more about this on pages 26-27. The property taxes residents and businesses pay to the city don’t supply the city with all the funding it needs to run daily operations? No, property taxes only make up 26% of the needed revenue for the City of Burleson. All of a resident’s property taxes that they pay go to the city, right? No, the city’s receives only 27% of your property taxes if you reside in Johnson County and 24% if you live in Tarrant County. Read more on pages 18-19. 27%, breaking down to $3.70 per day for homeowners. What are you getting for $3.70 per day? fair question we often ask is “What am I getting for my money?” Within the City of Burleson, this is very clear since the city’s budget is adopted at the same time the property tax rate is set. The top three contenders for your city tax dollars are the police department, debt service and general government per the adopted fiscal year 2018-19 budget. or $324.97 a year, or $0.89 a day, the PD will develop and implement programs to prevent and deter crime and enforce laws in order to protect life and property. ity debt cost for this year is $212.04, or $0.58 a day. he third biggest expense of $211.12, or $0.58 a day, this year is the is the city’s general government internal service departments such as Finance and the City Manager’s Office. he remaining $602.36 of the tax dollars goes to maintaining and growing the city’s fire department, library, parks and recreation center, streets for paving, drainage, and traffic; to name a few. While this presentation does not conform to Generally Accepted Accounting Principles (GAAP), the purpose of these statements is to provide the citizens with a selection of the information contained within the City’s Comprehensive Annual Financial Report (CAFR). The City’s accounting policies do conform to GAAP a set forth by the Governmental Accounting Standards Board. The City’s separately prepared and audited CAFR offers a complete description of the City’s significant accounting policies and other disclosures required by GAAP, as well as a more detailed analysis of the City’s financial position. A copy of the CAFR can be picked up at the Finance department at Burleson City Hall located at 141 West Renfro Street or can be found online at www.burlesontx.com. he revenues and expenses associated with city services most are familiar 8, the City’s Revenues totaled $36.2 million and $37.3 in Expenditures. nly $11,720 dollars more, or .12%, than the previous year. Similar to revenues, expenses increased too at nearly 10% over last year. Expectantly, each category spent roughly the same percentage of the $37.3 million as they did the previous year’s budget. Public safety made up half of the expense, totaling at $18.5 million. Twenty percent of the City’s expenses went toward general government including the City’s risk management, Finance and Communication departments. The last two collaborate each year to produce the Citizen’s Financial Report. The third largest expense category making up 18% of the City’s total expenses is Public Works. Public Works consist of paving, drainage, traffic control, and facility maintenance throughout the city. In FY 2018-2019 the adopted tax rate of 73.5 cents per $100 on assessed property value is expected to generate $23.5 million. These funds support the city’s general operations (police department, the fire department, the library, parks services, public pavement and drainage maintenance, the BRiCk) and the city’s debt issuance. Additionally, of the 8.25% of sales tax collected by the state in our city, the City of Burleson receives 2%, One percent towards general operations, estimated to generate $8.9 million. The other 1% is split evenly between the Type A and Type B Economic Development Corporation funds used to development the city’s commerce. The City of Burleson tracks the Water and Wastewater Fund and the Solid Waste Fund as business-like activities because they provide a good or service to the general public in exchange for a fee. Main differences is they are not profit driven, but service driven. This type of fund is formally known as a proprietary fund. SOLID WASTE FUND Another Proprietary Fund of the city is Solid Waste. Burleson spent nearly $3 million to collect trash, curbside recycling and other special collections for the citizens of Burleson. Fees collected from citizens for this service totaled $3.4 million.